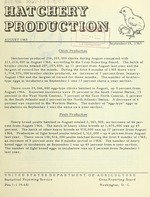 type eggs in incubators on September 1 was 13 percent above a year earlier. incubators on September 1 was the same as a year earlier. breed eggs in incubators on September 1 was up 49 percent from a year earlier. Pou 1-1 (9-65) Washington, D. C.
1 Massachusetts and Rhode Island combined to avoid disclosing individual operations. Thou. Thou. Pet. Thou. Thou. Thou. Pet. white Holland, Empire white, Lancaster, and crosses with light white breeds. Beltsville, Jersey Buff, Royal Palm and wild turkeys.